The warm wood toned lid and metal base of the Industrial Photo + Flash Box satisfies the wants of combining rustic and modern styles. The lid underside imprint (2" x .75") will be placed centered below the flash drive cutout. Choose an option for the lid top before continuing to the lid underside. By adding to the cart, you understand that you have chosen 'No customization'. This means the product will ship with no customization on the lid top or lid underside. By adding to the cart, you understand that you have chosen lid top customization only. This means the product will ship with customization on the lid's top but not the lid underside. By adding to the cart, you understand that you have chosen lid underside customization only. This means the product will ship with customization on the lid's underside but not the lid top. The warmth of wood and the industrial characteristics of metal is always a winning combo. 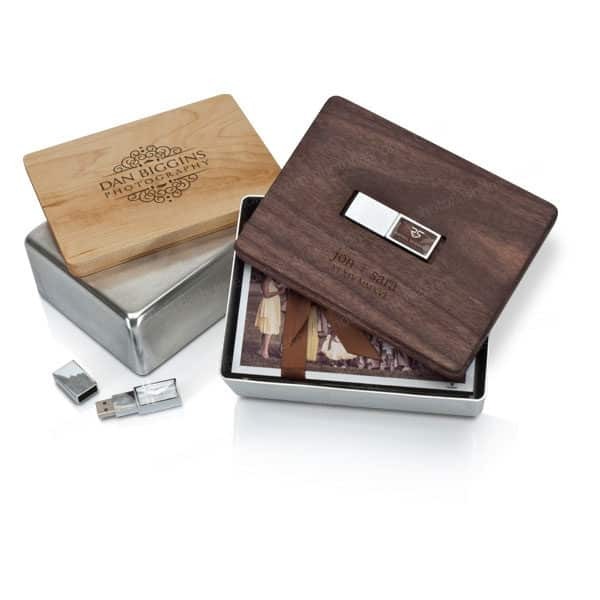 This relationship is on full display with this our Industrial Photo + Flash Box. The box itself is constructed of sturdy “not shiny” aluminum, features rounded corners and can be ordered in sizes that accommodate either 4×6 or 5×7 prints. The snug-fitting lid, available in maple or walnut wood, can be laser engraved on the top as well as the underside. This is ideal for including a prominent message or sentiment for your clients, while also ensuring your brand will always have some real estate on this keepsake item that is sure to stand the test of time.